My favorite type of participatory music is Singing. It has so many beneficial elements not to mention can be a lot of fun. There have been many studies done and much written on the healing power of the vibratory effects of toning and singing. As I see it, the main aspect is that it is just so much FUN! And fun and creativity is just plain good for you, in every way (see Key 5 in my book 7 Keys). Anyone can participate in the two types of singing groups I offer, regardless of skill or how much you like or don’t like the sound of your own voice. If you have any enjoyment in singing at all you will love experiencing one of these. 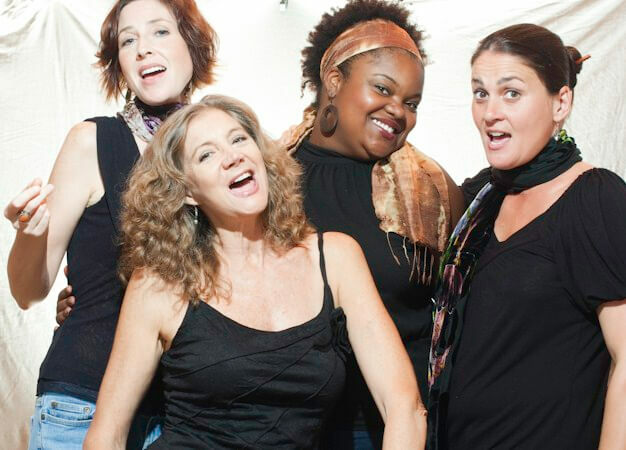 Using improvisational structures and vocal/rhythmic games from Bobby McFerrin and jazz singer Rhiannon, singers of all levels of ability can co-create fun and beautiful music together. Using interlocking patterns, rhythmic sound, and more we find in the moment melodies, harmonies, and co-created song. We will also engage in Voicestra, originally created by Bobby McFerrin. Through this joyful experience participants learn how to let go of self judgment during the creative process, which then carries into life. This enlivened form of singing is not only a lot of fun but expands one existing vocal capabilities. The techniques and process expand vocal strength and abilities, creativity and encourage personal expression. Yet very importantly it raises self esteem and the ability to takes heathy risks and trust. In addition, this work, disguised as just singing, has the capacity to expand participant’s expression and confidence in many other areas of life. I personally have witnessed it open up even already good singers voices tremendously, and bring boldness to the previously shy. Group singing that integrates Kirtan (originally east Indian chanting) with American circle songs and other simple repeatable songs from different traditions. This is a particularly joyful and uplifting experience. No singing skill is required only a desire to sing and express appreciation and gratitude for life. People report leaving these events feeling blissful, transformed and able to approach their lives from a different perspective. 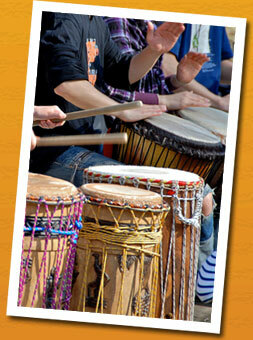 Participants learn the basic skills of how to play the drum and create rhythms. Then each participant experiences the joy and self confidence in being a creatively contributing member of a musically successful drum circle.Great for companies, conferences, any kind of gathering, party or life transition ceremony. This program is particularly effective for team building and creativity enhancement for small business or corporations. Through weaving specific messages into the process of creating a quality sounding drum circle, participants experientially learn principals and values that can be directly transferred to the workplace or in unifying any group.